sausage & eggs in the jeep. 120 dollars for the black ones with metal points. but lordy me, how fine you look while they are still with you. get them. they are strength and beauty and the sure notion that nothing lasts forever and we need to enjoy the here and who-occupies-our-now. Flip flops look good with your swoopy skirts, too. Plus boots cover up your toenail polish ;) I do love boots though, haven't had any in over 20 years. Come to think of it, I'm totally out of swoopy skirts, too. I love that shot . . . I bought some cowboy boots when we were in Jackson earlier this year and I've been desperately waiting for fall to arrive so that I can pack up my flip flops and put them on. Looks like it's finally here, wooo hooo. 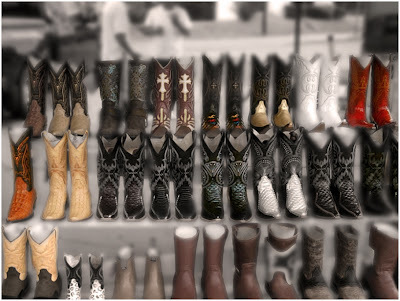 Oh I am wanting some boots. My husband sold his broken in one a couple years ago and I so wish we had kept them. I could have worn them for sure. Now go get you some white boots and enjoy kicking it up. i pulled my boots out last week but i'm looking for some new ones - planned on using my festival earnings to buy me a pair. Still in flip flops..I love it. I bough a pair of boots this fall... my very first pair. I LOVE them. Want to wear them every day. Now I need to buy more clothes to go with my lovely boots.